While still in high school, Ryan and his mom attended an open-house program at the Academy for Career Technology, a high school for students interested in technical careers. There, he met Jim, a teacher of horticulture (the study of plants) in the school's biotechnology program. Ryan asked Jim about taking his class on growing and caring for plants in greenhouses, and Jim accepted him into the class. For the next year, Ryan attended Jim's greenhouse class for two hours each day. He learned to identify and take care of plants in the school's greenhouse, and became especially interested in the many kinds of roses. At the end of the year, Ryan qualified for a certificate allowing him to work in plant nurseries. After high school, Ryan completed an assessment through a program at the University of Nevada (a community-based assessment ) to make sure he had the soft skills to succeed in a job. Ryan wanted to work in the university's rose gardens during the CBA. These rose gardens are very valuable and important to the university community. So the university required that the job coach conducting Ryan's assessment have a horticulture degree. Lori, Ryan's mom, found out that Jim was available to work with Ryan and was interested in being his job coach. Lori and Ryan trusted Jim, and knew that he understood Ryan's skills with plants and the kind of work that would be a good match for him. Jim became Ryan's paid job coach. During the CBA, Ryan maintained the university's huge rose gardens. He learned about keeping roses healthy by watering and pruning them, and checking for and identifying diseases. Jim coached him on useful soft skills, such as asking questions of other coworkers or supervisors. Jim taught Ryan that smart people ask questions so they can do their jobs the right way the first time. In the evenings at home, Ryan looked up information on the Internet about caring for different types of roses. Ryan compiled this information into a portfolio to look up later or show to a prospective employer. The university program also developed a short video resume for Ryan. Ryan began his job search after he completed the CBA. The university program arranged for Jim to be Ryan's job developer . Jim knew the owner at Moana Nursery and asked her about finding a position for Ryan there. The owner met with Ryan, watched his video resume, and agreed to hire him. Although the job site was not near his house, Ryan learned the difficult commute and arrived on time for work every day. Jim checked on Ryan once a week for the first three months. The rose plants became healthier during Ryan's first month on the job and thrived under his care for the season. 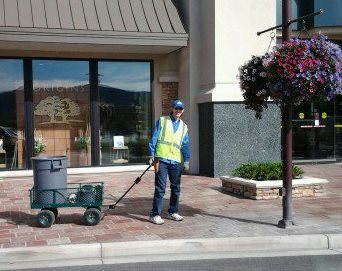 Ryan has worked for a season at Moana Nursery, managing landscaping at a large outdoor mall in Reno. He is responsible for the care of over 200 roses and daylilies. He plants, trims hedges, pulls weeds, and clears tumbleweeds. He works for 25 hours a week and earns nine dollars an hour. Ryan's employers have seen his willingness to work and eagerness to learn. They plan to have Ryan continue for part of the time at the outdoor mall and also work at the main nursery, closer to his home. At the main nursery, Ryan will likely care for plants midsummer for sale at the mall. Right now, he works from April through November. Ryan's employers are also thinking about tasks he might do so that he could work all year round. Ryan enjoys working outside, likes all the people at Moana Nursery, and has become an expert at a job he loves. Ryan chose to pursue his interest in plants to see if it could become a job someday. Ryan's mom contacted Jim, his teacher, about becoming his job coach. She knew Jim was good at supporting Ryan and could guide him in developing his career. Jim taught Ryan to be comfortable asking questions at work. This is good advice for anyone, but especially for someone doing a complex job like taking care of many plants in a big space. Working with Jim, Ryan gained the skills, confidence, and knowledge to become a valued employee at a successful nursery and landscaping company.